The 1959 Bazooka Baseball cards were originally cut from the bottom of boxes of Bazooka gum, which were marketed as the new 25 piece boxes nationally that year. 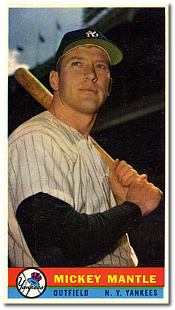 Yet, despite a national issue, the 1959 Bazooka cards are extremely scarce. The 1959 Bazooka set consists of 23 unnumbered cards in all. Bazooka originally issued boxes with 9 different player cards but later added 14 more with were printed in more limited quantities. The original nine players featured were Hank Aaron, Orlando Cepeda, Del Crandell, Jim Davenport, Mickey Mantle, Willie Mays, Bill Mazeroski, Roy McMillian and Bob Turley. The Hank Aaron card can be found with both white and yellow print for his name, however, they are similar in value. Star players included in the short-printed second issue were Richie Ashburn, Ernie Banks, Rocky Colavito, Don Drysdale, Harvey Kuenn and Duke Snider. The cards are approximately 3" x 5" and feature a color photograph of the player. The back of the card is blank. A 1959 Bazooka box still intact is worth significantly more. CLICK HERE if you want to sell your 1959 Bazooka Baseball Cards.